Dynamatic Homeland Security™ offers cutting edge security solutions to enhance the Nation’s capabilities in countering modern day security threats. Our strong Research and Development capabilities combined with the powerful partnerships we have forged with leading “global security technology” companies enables us to offer potential customers like India’s National Defence Forces, Homeland Security Forces, Police and Civilian Agencies in developing solutions relating to Access Control, Visual-Intelligence, Counter Terror Mechanisms, Specialised Communications, Armour, Bomb-Disposal, Command Centers, and Training, that will enhance their abilities to prepare and plan for emergencies as well as their response and recovery skills. Dynamatic offers its indigenously developed VTOL UAS solution suitable for Intelligence, Surveillance and Reconnaissance operations by the Police and Para Military. Dynamatic Patang™ is a light-weight, easily deployable vertical take off and landing Unmanned Aerial Vehicle, capable of being launched from an area of 25m2 or less, with no need of preparation of surfaces. Rapid deployment and quick turnaround, ruggedness and reliability, long endurance and mission time, negligible audio signature, no need of launching aids and complete autonomy makes Patang™ an ideal platform for the para military for ISR activities. Dynamatic Homeland Security™ designs, develops and custom-builds sophisticated monitoring & surveillance solutions for mobile and stationary applications, which are capable of monitoring infiltration and gathering real-time visual intelligence in cities as well as in remote and hostile environments. These special monitoring and surveillance systems which can combine Special Multi Sensory Heads, Day Light and Infra Red Cameras and Powerful Radar Systems with the necessary customized software, offer a highly effective integrated day/night observation platform that delivers performance under the most exacting conditions. 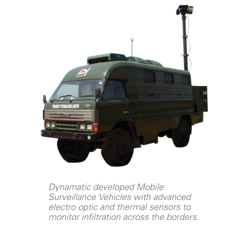 The Dynamatic Technologies Rakshak is a unique Mobile Surveillance Vehicle (MSV) developed for India’s Security Forces, which is capable of monitoring infiltration on the Country’s borders, as well as providing real-time Visual Intelligence within Cities. 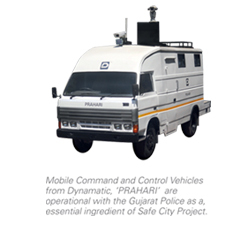 The Rakshak is a 4-wheel drive vehicle specially built for deployment on any kind of terrain, and, is equipped with a sophisticated surveillance system including Day Light Camera, Infra Red Camera and Laser Range Finder, capable of detecting, scanning and recording in day-night conditions. Its ergonomically designed interiors provide the operating team with comfort in addition to safety. Dynamatic's partnership with EL-GO Team, Israel, a world leader in Cutting-Edge, Anti-Terror Security & Access Control Systems, enables it offer a comprehensive range of world-class Perimeter Security Products and Solutions in India. The product offerings, which integrate cutting-edge technology with sleek aesthetics for performance and durability, include Crash Rated Bollards and Barriers, Spike Systems/Tyre Killers, Road Blocks and Turnstiles, and can be used as robust stand-alone security solutions or be integrated to create a sophisticated Building Management system (IBMS). 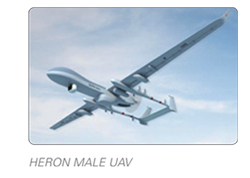 Dynamatic has partnered Israel Aerospace Industries(IAI) earlier this year for manufacture of UAVs in India. IAI has been a reliable partner of the Indian MoD for over two decades with critical products and technologies. Israel Aerospace Industries (IAI) is a globally recognized leader in the delivery of state-of-the-art systems for the defense and commercial markets. IAI offers unique solutions for a broad spectrum of requirements in space, air, land, sea, cyber, and Homeland Security. IAI is the largest government owned defense and aerospace company in Israel. Over the past 60 years IAI delivered, supplied and supported advanced systems for the Israeli Ministry of Defense as well as many demanding customers worldwide. As a national center of excellence for advanced technological fields IAI maintains extensive research and development (R&D), engineering, manufacturing and testing capabilities to develop, produce and support complete systems, from the component, sensor and sub system to large scale integrated systems, support systems of expertise. This capability is also reflected by the company’s manpower - IAI is the largest employer of engineers in Israel; R&D makes about a quarter of the company’s annual budget. Carmor Integrated Vehicle Solutions is among the international market leaders in designated vehicles for military and civilian applications. This highly respected international brand now manufactures vehicles for NATO and United Nations forces, and for civilian administrations, homeland security and military procurement departments. Carmor specializes in the design and production of armoured 4x4 all-terrain military vehicles for a wide range of applications, including border patrol and peace-keeping, personnel carriers and medical evacuation. Carmor’s unique multi-layered protection includes APS, kinetic and underbelly armouring unto STANAG 4 with provisions for adding weapons and surveillance systems or configuring as ambulances for medical evacuations. They can be customised to withstand rigorous terrains requirements. These vehicles are tested in action and under fire with rigorous laboratory testing to ISO9001 and ISO 14001 standards. Dynamatic has partnered Carmor to manufacture Armoured and multipurpose vehicles under MAKE IN INDIA initiative. Magal Security Systems Ltd., is a leading international provider of integrated security systems and products for physical security, safety and site management. Magal’s systems are installed in more than 75 countries worldwide, in airports, borders, nuclear facilities, military bases, communications centres, sea ports, nuclear stations, power plants, oil and gas facility, prisons, important government establishments and other critical assets and infrastructure. MAGAL-S3 has developed its expertise on the world’s most difficult border - Israel, experience that will be relevant in helping secure India’s borders and facilities against intruders and terrorists. Dynamatic has partnered MAGAL-S3 for comprehensive Border Management & Physical Security Systems. This partnership will bring to India unique capability of integrating feed from a vast range of sensors to provide real-time intelligence and situational awareness. This will enhance our capability in securing our otherwise difficult to man porus borders with varied Terrains.